Did you know that clogged and leaky gutters pose a serious threat to your property's structural integrity? Unfortunately, yes. During the winter session, freezing and thawing and refreezing can lead to the formation of ice dams on your gutter and downspouts, and this is why you require Provo Snow removal service. An ice dam is a wall of ice that forms on the edge of the roof, usually at the gutters. When it does, it prevents melting snow from draining water off the roof and can compromise your roof structure. While an ice dam itself does not pose any threat, it results in the accumulation of water on the roof, which eventually leaks through the roof shingles into your property's insulation, ceiling, and walls, hence weakening the overall structure. Also, ice dams can pull the gutter off, leading to structural damage and potential flooding. Icicles are pretty but can be a real threat, especially if the form in your gutters. There're steps that you can take to prevent your gutter from freezing during winter and formation of ice dams in gutters. Maintenance and regular cleaning of your gutters and downspouts is the key towards keeping your gutters free of frozen snow. Before the temperatures drop below freezing, ensure that gutters are clear of any debris. This will avoid the water and debris being “caught” in the eavestrough and freezing into a channel of frozen muck. Alternatively, you can let us install your home with heating cables for frozen gutters. 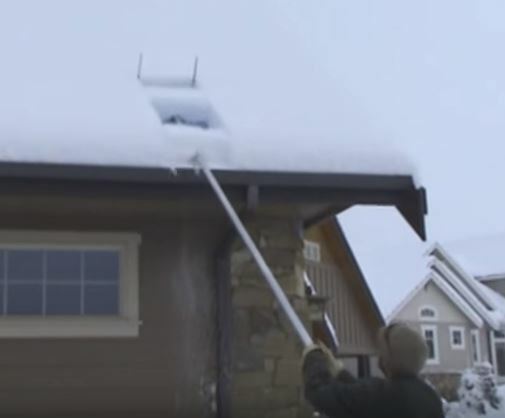 If you're looking for a premium grade solution to prevent frozen pipes or ice damming roofs, gutters and downspouts, Provo Snow Removal, Utah, offers cut-to-length protection to your roof. Our electric heating cables run inside the gutters and downspouts and help in providing maximum anti-freeze protection in ambient temperatures. Attic insulation, laying of ice shields and proper attic ventilation are all great ideas for protecting your property against ice damage, but they’re not effective, and there's proof that the above measures may not prevent the formation of ice dams under many “prime” conditions. One of the most effective ways of curbing the ice dam menace is by having a heat tape that is professionally designed for your gutters and downspouts. At Provo Snow Removal, we offer professional heat tape for downspout installation services. Our heat tape system allows the ice dam to steadily melt, prevent the occurrence of freezing downspouts and keep your gutters and downspouts clear and free of water or snow. Unlike the heated cables, our heat tape for downspouts is typically installed to address specific issues around your property. What is great about our heating cables is that you can even wrap your downspouts with a heat tape even if it's below the ground. If you're worried about your underground downspout freezing because you cannot access them, you'll be glad to know that our team has got you covered. We've the necessary skills and equipment to ensure that no freezing occurs on your property, even in the remotest locations. At Provo Snow Removal, we specialize in the provision of both residential and commercial gutter snow removal services, in Utah and the surrounding neighborhoods. We recommend that you have your roof system inspected before the onset of the winter session to ensure that your better resistance and perform the necessary repairs. Contact us today so that we can inspect your roof before winter sets in.